In drama classes, the Viola Spolin method is used as a basis for theater training for comedy and straight drama. Students learn improvisation and present various scenes to classmates for discussion and critiques. The Upper School productions generally include Shakespeare in the fall and a musical in the spring that brings Broadway a little closer to home. 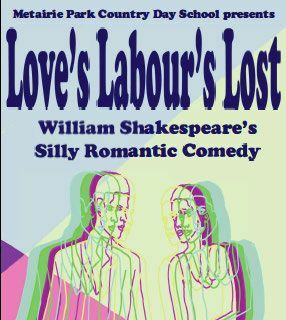 MPCDS presents William Shakespeare's silly romantic comedyLOVE'S LABOUR'S LOST! The King of Navarre and three of his lords make a pact to swear off women for three years and devote themselves to study. What happens, then, when the Princess of France and her entourage of ladies arrive with urgent business for the King? Will the men keep their sworn oaths to be pure in mind and body, or will the women force them to break their vows and embrace romance? With colorful characters, misdirected love letters, secret affairs, and ridiculous disguises, LOVE'S LABOUR'S LOST is a giddy and sweet celebration of falling in love. Shakespeare's play, believed to have been written about 1597 for a commissioned court performance, satirizes different historical figures of the day and features the Bard at perhaps his most word-playful. As the play has aged, it's lost the connection to the period personalities upon which it's based; and it is embraced now as more of a curiosity. Although the plot is wafer-thin, the characters are fun and the language rich. For our production, we've made some edits and "improvements," as some of the jokes and wordplay have not stood the test of time; but in its original format, the play includes Shakespeare's longest single speech, his longest scene, and the longest word in the canon: "honorificabilitudinitatibus," spoken beautifully in our production by junior Abby Myers. LOVE'S LABOUR'S LOST features the talents of Colleen Daly, Katie Davidson, Elizabeth Downs, Bryce Elmore, Ruffin Henry, Julianna Holley, Shinwoo Kim, Joanna Moody, Jacob Mushatt, Abby Myers, Grayson Myers, Alexandra O'Sullivan, Ethan Taylor, Isabella Torres, Steven Wagner, and Emily Weinmann. Production stage managers are Maya Cvitanovich and Caroline Fiore, with technical support from Barbie Cassavetes, Scott Freeman, Tai Suarez, Jane Fantaci, Destiny Laugand, and Miles Bellaire. The poster for our production is the work of senior Emily Weinmann. You may remember her fabulous design for last year's Hamlet, which brought some familiar elements of her work together in a beautiful trompe l'oeil image that perfectly captured the theatricality of our production. This year, Emily is experimenting with digital design, which connects nicely with our concept of setting the production in the 1980s. Emily's use of geometric shapes, intersecting lines, repeated figures, and juxtapositions of color underscores the romantic couplings of the plot and the whimsical chaos that arises from the lovers' misunderstandings. A jpg of Emily's bold, engaging design is attached. Posters will be going up tomorrow. Please let me know if you'd like one to display. 2. Choose the performance you wish to attend. 4. After you choose the number of tickets you want, choose your delivery method. 7. COME SEE THE SHOW! As in the past, if you prefer to avoid the online process, we will have paper tickets available at the door. Thank you for your continued support of Drama at Country Day!